A tonsillectomy is a surgical procedure performed to remove the lymph tissue (tonsils) that reside on both side of the back of the throat. Thanks to our skilled medical staff and state-of-the-art equipment, we promise to make the entire experience as comfortable as possible for your child. It is a surgical intervention performed to remove the tonsils. Surgically extirpating the tonsils is recommended after multiple or severe infections that prevent the tonsils from shrinking down to normal dimensions. Taking out the tonsils can avert nose and ear conditions for the child in the future. The physician will perform a complete physical exam in order to determine the correct diagnosis and the appropriate course of action. Tonsillectomy is most commonly recommended if the child suffers from sleep disordered breathing or sleep apnea. Surgery might also be in order if the child experiences frequent sore throats/infections within a relatively short timeframe. 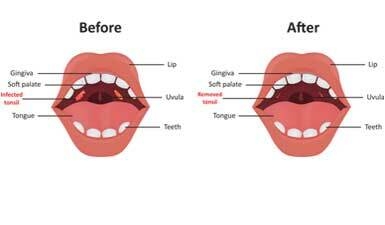 Take note that tonsillectomy is a regular major surgical procedure performed on children. Although it implies the extirpation the tonsils, the procedure is performed most commonly on an outpatient basis, meaning that someone who undergoes the operation can go home on the same day. Before the surgical intervention, the child will be anesthetized in the operating room. The actual procedure entails extracting the tonsils through the mouth; therefore, there will be no incisions in the neck area. Similar to other surgery performed under general anesthesia, the tonsillectomy comes with a very small risk of complications. The most frequently encountered complications associated with the procedure include bleeding, dehydration, difficulty in breathing and fever. As previously mentioned, tonsillectomy is most commonly performed as an outpatient procedure and hence, the child can go home on the same day. The physician may prescribe pain medications to settle the child’s sore throat. In the following week, parents should make sure the child doesn’t catch a cold and drink plenty of fluid. If you notice any of the aforementioned symptoms and suspect that your child might be suffering from sleep apnea or tonsillitis, then feel free to give us a call. Our friendly staff will help you book an appointment right away.